The bearded dragon is a lizard that is native to Australia, but they have found their way in the United States. They are cute and friendly, making them one of the most popular choices amongst people who are looking for reptiles as pets. Handling them is also fairly straightforward as you will learn in the rest of this post. Even if you have no prior experience in taking care of reptiles, the bearded dragon should be on the top of your list if you want to have a docile pet. The stunning physical appearance of the bearded dragon is sure to captivate anyone’s attention. Its color usually ranges from tan to yellow. It has a beard of spikes that wrap around its neck, which is usually a display of its mood. When it feels threatened, the beard can inflate, and the colors may also change. Meanwhile, the body of the bearded dragon is flat. It becomes even flatter when it becomes alarmed. The color or morphs of the bearded dragon will vary, although they are often orange, yellow, or red. One of the most popular breeds is the sandfire bearded dragon, which has an attractive red hue. The average weight of bearded dragons is from 350 to 600 grams. The length, on the other hand, usually ranges from 16 to 24 inches, which is already inclusive of the tail. In the wild, the average lifespan is 10 to 15 years and up to 29 years in captivity. 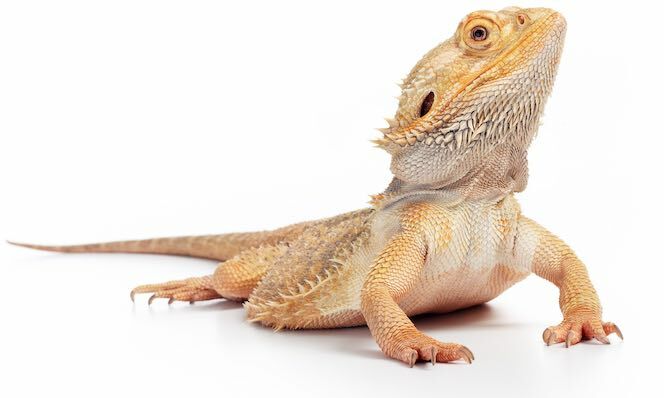 Often, bearded dragons are well-behaved and even-tempered, making them a great choice for reptile pets. They will easily respond to the touch and voice of the owner. Even children can handle them without a problem, but it is always best to keep an eye. To know if the bearded dragon feels threatened, watch the beard. If it lies flat on the ground, it is at peace. On the other hand, when it begins to inflate, which will make the dragon appear as if it has a beard, this is an indication that it feels threatened. With the housing for the bearded dragon, one of the most important is the size, Make sure that there is enough room for it to move around. For one adult bearded dragon, the average size of the tank that you will need is 55 to 75 gallons. They grow quite fast, so there is no sense in investing in a small tank.
. It is also important to make sure of a consistent light and dark cycle. Ideally, the light should be on for about 12 to 14 hours in a day.
. An ideal environment for a bearded dragon will have a temperature of 80 to 85 degrees Fahrenheit. Meanwhile, their basking spot could go as high as 105 degrees Fahrenheit. For the bedding, avoid sand or any other type of loose substrate when the bearded dragon is young. It can be ingested accidentally and will result in intestinal impaction. Even when they are already adults, it is important to avoid substrate with small particles. Carpets and newspapers will be great choices. The health of the bearded gecko will be heavily influenced by its diet. When they are in the wild, they are omnivores and will feast on insects, small animals, and plant matter. When they are in captivity, on the other hand, their diet often includes crickets, locusts, mealworms, peas, turnip greens, plums, apricots, peeled bananas, green beans, kale, grapes, seedless strawberries, blueberries, and broccoli. , providing an assurance that the bearded dragon will not suffer from dehydration. Metabolic bone disease is one of the most common problems in lizards and geckos, including the bearded dragon. This is a result of the unbalanced calcium and phosphorus in their diet. Their bones will become softer and this will make them easily prone to fractures. They can also often suffer from respiratory infections. Add smooth rocks in the flat-bottomed tank, which will help for the toenails to wear down. This will make it easier to handle them. Clean the food and water bowls regularly. Use 1-part bleach with 10 parts of water for a household cleaner. Make sure that they are properly rinsed. Although bearded dragons are well-behaved, care must be observed when they are handled. If you need to pick the dragon, gently place your hand under the abdomen and scoop it. When the dragon is already on the top of your palm, have your hand curved lightly. Generally, you can keep more than one bearded dragon in a cage. A female and male bearded dragon can live together harmoniously. However, during the mating season, the aggressiveness of the male dragon will make it a threat, so it will be best to have it isolated. www.watersnake.net is a participant in the Amazon Services LLC Associates Program, an affiliate advertising program designed to provide a means for sites to earn advertising fees by advertising and linking to Amazon.com. Amazon and the Amazon logo are trademarks of Amazon.com, Inc., or its affiliates. Additionally, www.watersnake.net participates in various other affiliate programs, and we sometimes get a commission through purchases made through our links. We do not specifically market to children under 13. Anders Nielsen PhD in Ecology, University of Oslo. Founder of watersnake.net and www.cottonmouthsnake.net.